On 5 May 2013, Rev. 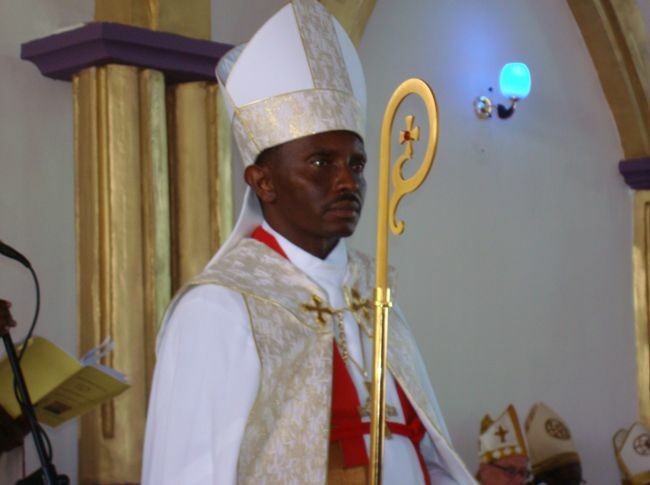 Emmanuel Makala was consecrated the first Bishop of the newly established South East of Lake Victoria Diocese (SELVD) of the Evangelical Lutheran Church in Tanzania (ELCT). The Consecration of the Bishop and inauguration of the new diocese took place at Ebenezar Lutheran Cathedral in Shinyanga on 5 May 2013. Bishop Makala was born 6 August 1964 at Kiziga Village, Iramba District, in Singida region and attended Primary School at Yalagano Primary School in Singida Region 1976-1983. He then joined the Morogoro Lutheran Junior Seminary 1986-1990 for O Level through A Level 1991-1993. He joined Tumaini University Makumira to study for his Bachelor of Divinity degree 1994-1999 and was ordained to become a pastor in September 1999 at Mwadui Lutheran Parish in the ELCT East of Lake Victoria Diocese. He served the Parish 1999 -2004 before joining Makumira for Masters of Theology studies 2004-2007. After his masters studies he served Shinyanga Lutheran Parish from 2007 to 2008 as well as being appointed District Pastor of the Southern District of the same Diocese. He became Dean of the Lutheran Cathedral in Mwanza in the East of Lake Victoria Diocese (ELVD) from 2008 until December 2012 when the General Assembly of the South East of Lake Victoria chose him to become Bishop-elect. He has been enrolled at Concordia Seminary in the United States of America for Doctor of Ministry studies since 2011.